Inscribed in plate: ''Corot Del.& Sculp." and "Gazette des Beaux-Arts / Souvenir de Toscane / Imp. A. Salmon Paris''. 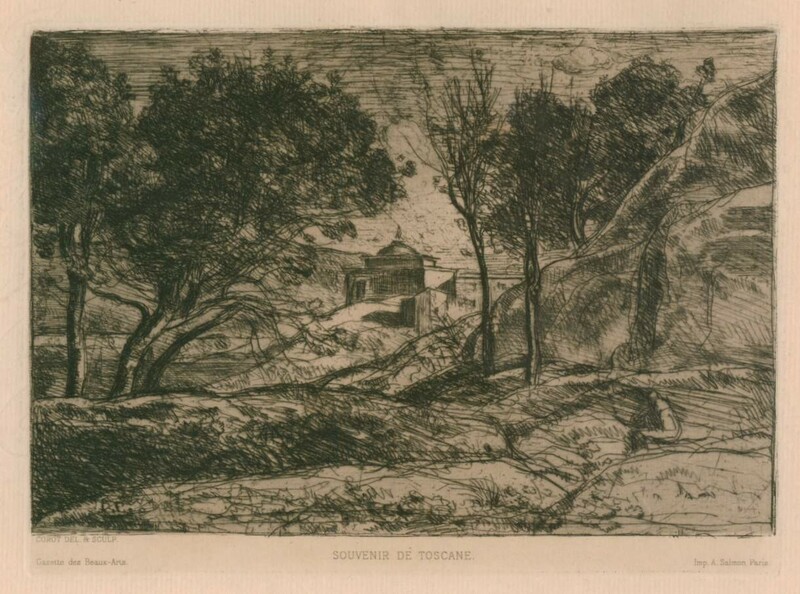 Dramatic tonal variations characterize this romanticized view of the Tuscan landscape. Depicting the seductive quiet of a provincial lifestyle; Corot entices the viewer along an intimate path, inundating the senses with imagined sensory stimulus. Originally executed in 1845, this is an example of the fourth state of this image. The work was printed by Salmon, Paris and published by the Gazette des Beaux-Arts in 1875. Reportedly the plate was discovered by the engraver Felix Bracquemond in a box of nails and was first printed in 1865. The artist’s extensive working of the plate creates an image that is both quieting and energetic. Using varied techniques throughout the image, Corot creates an impressive textural quality which varies from the gnarled tree bark to the rounded forms of the rock outcropping seen along the right of the image. As the viewer progresses through the image, passing a praying monk along the right, one is lulled by the delicately layered landscaped. Passing through shadows and concealing brush, the viewer is ultimately confronted by a picturesque domed structure seen along the horizon. Jean-Baptiste Camille Corot was born in Paris on 26 July, 1796. He was raised in a middle-class family in Rouen. He initially did a training as a cloth merchant, which he did not like. At the age of 26 he quit the job in order to become an artist. In 1822 Corot took painting classes by his successful peers A. E. Michallon and Victor Bertin. He made a lot of trips to Italy too. Back in Paris he used his impressions as an inspiration. After 1831 Jean-Baptiste Camille Corot regularly and very successfully presented his pieces in the salons of Paris. His contacts to the painters of Barbizon became much closer after the end of the 1840s, especially to Daubigny. Due to the gout, Corot had to slowly give up landscape painting. His later works are dominated by lady portraits, which he painted in a controlled and free manner. Corot passed away in Ville d'Avray on 22 February,1875.